Not many stories about Park51 include interviews with both Pamela Geller and Imam Rauf, but 60 Minutes’ does. It’s well worth the almost 13 minutes. Neither puking hatred or semi-informed emotion – it is words like these that remind us what it means to be an American. “We have come here to Governors Island to stand where the earliest settlers first set foot in New Amsterdam, and where the seeds of religious tolerance were first planted. We’ve come here to see the inspiring symbol of liberty that, more than 250 years later, would greet millions of immigrants in the harbor, and we come here to state as strongly as ever – this is the freest City in the world. That’s what makes New York special and different and strong. “Our doors are open to everyone – everyone with a dream and a willingness to work hard and play by the rules. New York City was built by immigrants, and it is sustained by immigrants – by people from more than a hundred different countries speaking more than two hundred different languages and professing every faith. And whether your parents were born here, or you came yesterday, you are a New Yorker. “We may not always agree with every one of our neighbors. That’s life and it’s part of living in such a diverse and dense city. But we also recognize that part of being a New Yorker is living with your neighbors in mutual respect and tolerance. It was exactly that spirit of openness and acceptance that was attacked on 9/11. 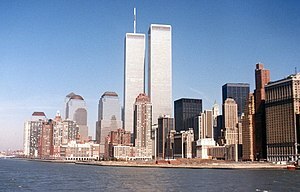 “On that day, 3,000 people were killed because some murderous fanatics didn’t want us to enjoy the freedom to profess our own faiths, to speak our own minds, to follow our own dreams and to live our own lives. “Of all our precious freedoms, the most important may be the freedom to worship as we wish. And it is a freedom that, even here in a City that is rooted in Dutch tolerance, was hard-won over many years. In the mid-1650s, the small Jewish community living in Lower Manhattan petitioned Dutch Governor Peter Stuyvesant for the right to build a synagogue – and they were turned down. “In 1657, when Stuyvesant also prohibited Quakers from holding meetings, a group of non-Quakers in Queens signed the Flushing Remonstrance, a petition in defense of the right of Quakers and others to freely practice their religion. It was perhaps the first formal, political petition for religious freedom in the American colonies – and the organizer was thrown in jail and then banished from New Amsterdam. “In the 1700s, even as religious freedom took hold in America, Catholics in New York were effectively prohibited from practicing their religion – and priests could be arrested. Largely as a result, the first Catholic parish in New York City was not established until the 1780’s – St. Peter’s on Barclay Street, which still stands just one block north of the World Trade Center site and one block south of the proposed mosque and community center. “This morning, the City’s Landmark Preservation Commission unanimously voted not to extend landmark status to the building on Park Place where the mosque and community center are planned. The decision was based solely on the fact that there was little architectural significance to the building. But with or without landmark designation, there is nothing in the law that would prevent the owners from opening a mosque within the existing building. The simple fact is this building is private property, and the owners have a right to use the building as a house of worship. “The government has no right whatsoever to deny that right – and if it were tried, the courts would almost certainly strike it down as a violation of the U.S. Constitution. Whatever you may think of the proposed mosque and community center, lost in the heat of the debate has been a basic question – should government attempt to deny private citizens the right to build a house of worship on private property based on their particular religion? That may happen in other countries, but we should never allow it to happen here. This nation was founded on the principle that the government must never choose between religions, or favor one over another. “The World Trade Center Site will forever hold a special place in our City, in our hearts. But we would be untrue to the best part of ourselves – and who we are as New Yorkers and Americans – if we said ‘no’ to a mosque in Lower Manhattan. “Let us not forget that Muslims were among those murdered on 9/11 and that our Muslim neighbors grieved with us as New Yorkers and as Americans. We would betray our values – and play into our enemies’ hands – if we were to treat Muslims differently than anyone else. In fact, to cave to popular sentiment would be to hand a victory to the terrorists – and we should not stand for that. “For that reason, I believe that this is an important test of the separation of church and state as we may see in our lifetime – as important a test – and it is critically important that we get it right. “The attack was an act of war – and our first responders defended not only our City but also our country and our Constitution. We do not honor their lives by denying the very Constitutional rights they died protecting. We honor their lives by defending those rights – and the freedoms that the terrorists attacked. “Of course, it is fair to ask the organizers of the mosque to show some special sensitivity to the situation – and in fact, their plan envisions reaching beyond their walls and building an interfaith community. By doing so, it is my hope that the mosque will help to bring our City even closer together and help repudiate the false and repugnant idea that the attacks of 9/11 were in any way consistent with Islam. Muslims are as much a part of our City and our country as the people of any faith and they are as welcome to worship in Lower Manhattan as any other group. In fact, they have been worshipping at the site for the better part of a year, as is their right. “The local community board in Lower Manhattan voted overwhelming to support the proposal and if it moves forward, I expect the community center and mosque will add to the life and vitality of the neighborhood and the entire City.